Some night skies are serene and passive — others shimmer and flash. The later, in the form of auroras and meteors, haunted skies over the island of Kvaløya, near Tromsø Norway on 2009 December 13. This 30 second long exposure records a shimmering auroral glow gently lighting the wintery coastal scene. A study in contrasts, the image also captures the sudden flash of a fireball meteor from the excellent Geminid meteor shower of 2009. Streaking past familiar stars in the handle of the Big Dipper, the trail points back toward the constellation Gemini, off the top of the view. 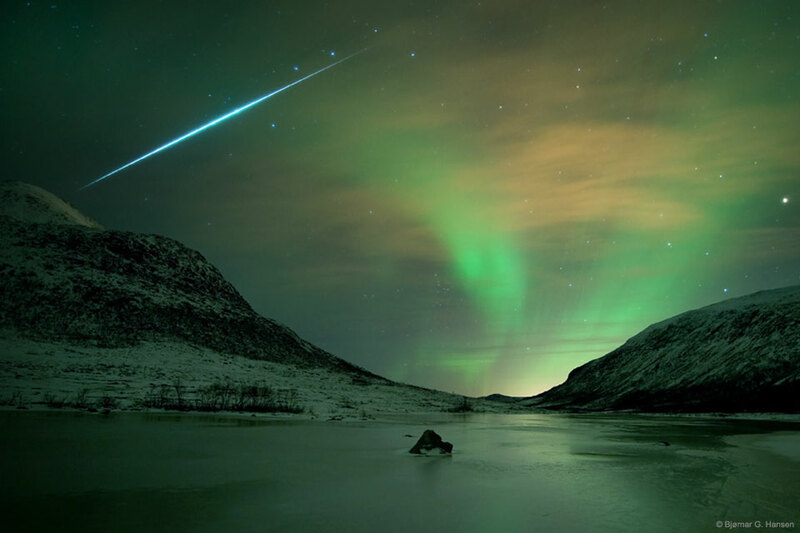 Both auroras and meteors occur in Earth’s upper atmosphere at altitudes of 100 kilometers or so, but aurora caused by energetic charged particles from the magnetosphere, while meteors are trails of cosmic dust. Nine years after this photograph was taken, toward the end of this week, the yearly 2018 Geminids meteor shower will peak again, although this time their flashes will compete with the din of a half-lit first-quarter moon during the first half of the night. Posted on Sunday, 9 December 2018 by VGC	This entry was posted in ifttt-photograph and tagged IFTTT, NASA. Bookmark the permalink.